From China, both our title photo as well as our inset photo were taken in that natural habitat of 'L. xanthellum var. luteum'. This species is native to the western province of Sichuan and is very rare in the Yunnan. 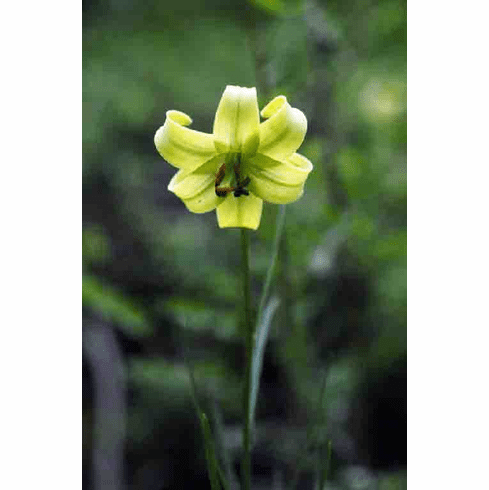 It can be found growing on rocky slopes and in valleys of mixed forest if partially shaded locations. Grows at altitudes of 10,500 to 13,000 feet (3,000 to 3900 meters). Seeds of this species are said to be immediate epigeal . Title and inset photo #1 Coypright David Boufford, all rights reserved. Used with permission. Photo insert #2 is from Yundong Gao of the Chinese Academy of Sciences;Phytotaxa�226(2):196�198���September 2015 showing the color and spotting range found within a single colony of 'L. xanthellum var. luteum. His work was titled - Continuous-variation-within-one-population-of-Lilium-xanthellum-. Photo was cropped to show just two examples.